It has been widely believed that camera phones have been eating digital still cameras’ lunch. The argument is compelling given that phone cameras are constantly improving, smartphones with better cameras are becoming more prevalent, a phone camera offers the convenience of being always with us. The Camera and Image Products Association of Japan provides data on the number of units produced, shipped and their value. Most major digital camera vendors participate in this research[pdf]. The data from CIPA is a good proxy for the industry. Let us read into the trend based on the shipment data. 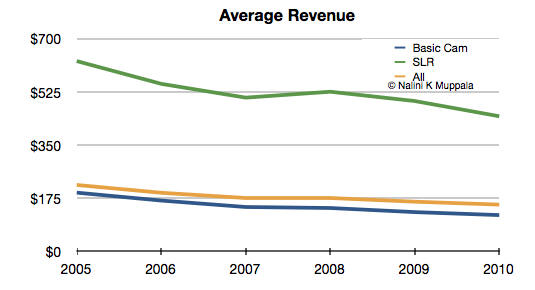 Revenue from basic cameras has been steady. There is no significant growth. 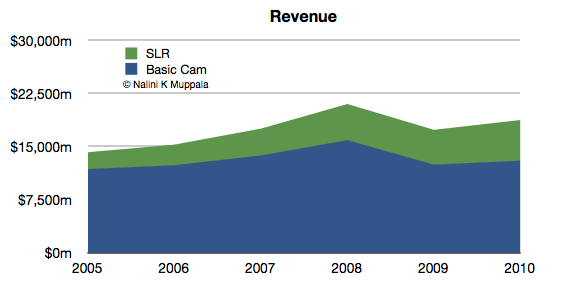 Revenue from SLR cameras is growing slowly. 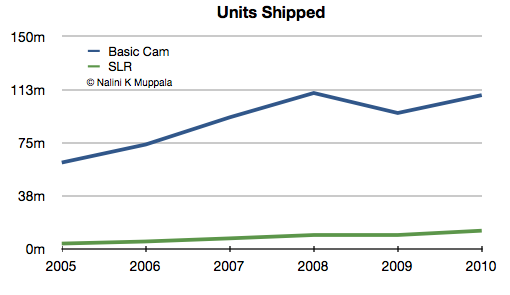 Number of basic camera units shipped is growing at a healthy pace. SLR cameras unit shipment are growing albeit at a much slower pace. Where is the unit growth coming from? My guess is as cameras become more affordable, as illustrated in the third chart, more people are able to afford a basic still camera. This population most likely has a high correlation with the non-smartphone users. Users of basic camera are upgrading to SLR as they become more affordable. All cameras are becoming cheaper. SLR price drop is faster than basic cameras. The decline could be attribute to maturing technology. Still camera manufacturers are making up for reduced prices in increased volumes. It could be argued that the growth would have been stronger and prices would have held up better in the absence of the onslaught of camera phones. However, DSC manufacturers are holding up quite well.